Tag line: "The adventure continues"
I adore Superman II. When I saw it in the theater back in 1980, the audience laughed and applauded in all the right places, and years later, when I recorded it off of cable TV, I played the tape over and over (sometimes twice a day). It was, for a time, one of my favorite movies, and even though my tastes have changed since then, I feel like a kid again the moment the opening credits begin. After saving Lois Lane (Margot Kidder) from Parisian terrorists (who threatened to incinerate the Eiffel Tower, and all of Paris, with a hydrogen bomb), Superman (Christopher Reeve), posing as his alter-ego Clark Kent, accompanies the feisty Lois to Niagara Falls, where the two reporters must pose as newlyweds to expose a price-gouging ring. But when Superman turns up out of the blue (to save a young boy from falling to his death), Lois puts 2 and 2 together and figures out that her co-worker Clark is, in fact, Superman. Though he tries to deny it, Superman eventually confesses, and flies Lois to his Fortress of Solitude for an evening of romance. But before the night is out, the Man of Steel will make a life-altering decision that, if all goes well, will allow him to be with Lois for the rest of his days. What Superman doesn’t know, however, is that three arch-criminals from his home planet of Krypton: General Zod (Terence Stamp), Ursa (Sarah Douglas) and Non (Jack O’Halloran), have been freed from the Phantom Zone (a mobile prison that Superman’s father, Jor-el, banished them to in the first movie). After a brief stop at the moon, where they disrupt a joint U.S.-Russian lunar mission, the three baddies head to earth, each one possessing powers as great as Superman’s. Upon their arrival, Zod, Ursa, and Non destroy a small Idaho town, then make their way to Washington D.C., where Zod orders the President of the United States (E.G. Marshall) to step down. But it isn’t until Lex Luthor (Gene Hackman), who recently broke out of prison, shows up on the scene that Zod and the others learn this “Superman” they’ve been hearing so much about is actually the son of their enemy, Jor-El! As the trio of criminals continues to wreak havoc, Superman vows to do everything in his power to stop them. But is he strong enough to defeat all three at once? It breaks my heart to say it, but some portions of Superman II simply don’t hold up, starting with the Paris / Eiffel Tower sequence, where characters do things that make absolutely no sense (Lois’s spur-of-the-moment decision to hide under one of the elevators was perplexing, to say the least, but pales in comparison to the actions taken by the Paris authorities, who, for some unknown reason, thought it would be a good idea to sever the elevator’s cables, causing both the elevator car and the hydrogen bomb to plummet to the ground below). Also, the Niagara Falls scenes are a bit clunky (especially when Lois decides to “test” Clark, in the hopes he’ll reveal himself as Superman), and a late sequence, where Superman faces off against his three adversaries inside the Fortress of Solitude, has the Man of Steel utilizing powers he never displayed before (such as teleportation), making the entire scene feel like a cheat. 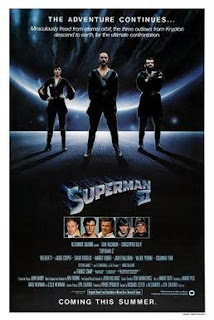 That said, I still love Superman II, from its opening credits (where, after once again witnessing Zod and his cohorts being banished to the Phantom Zone, we get a recap of the events from 1978’s Superman) to the criminal’s initial encounters with mankind, first on the moon and later in that small Idaho town (Clifton James, who played a sheriff in both Live and Let Die and The Man With the Golden Gun, appears briefly as a lawman who has an unfortunate run-in with Zod and the others). Topping everything, though, is the battle between good and evil that takes place in the heart of Metropolis, with Superman trying to protect the populace while also fighting Zod and his two minions. All these years later, this showdown still gives me goosebumps. As for the cast, Christopher Reeve once again proves beyond a shadow of a doubt that he is Superman, bringing a humanity to the character that shines through in every scene; and Margot Kidder’s Lois Lane is as tenacious (and lovestruck) as ever. As for the villains, Stamp, Douglas, and O’Halloran make for worthy adversaries, and you gotta love Gene Hackman’s Lex Luthor, who, this time around, is little more than a lackey for General Zod (as with the first film, Hackman is funny as hell throughout Superman II). In 2006, an alternate cut of Superman II was released. Richard Donner, who directed the original Superman, was dropped after shooting more than half of Superman II. His replacement, Richard Lester, removed or altered many of Donner’s scenes. This 2006 cut features Donner’s original version, using a variety of sources to piece it together as completely as possible. I’ve seen “The Richard Donner Cut” only once, and it is very different from the 1980 theatrical release. Is it better than the movie I loved as a kid, or is 1980’s Superman II still the definitive take on the story? More on that later. For now, I’m happy to report that I enjoyed the time I spent re-watching Superman II. In a way, it was like visiting an old friend, and seeing it again conjured up plenty of great memories.